They are often refrigerated along with mealworms at pet stores. They are used as fish bait. I bought mealworms from PetSmart for the first time tonight. How do I know if they are giant or not? The label doesn't say. The giants can be around 2 inches long. If the ones you got are small enough to feed to a baby bearded dragon they are the normal ones, if that helps at all haha. that looks like a superworm.....right? which is different from a mealworm? 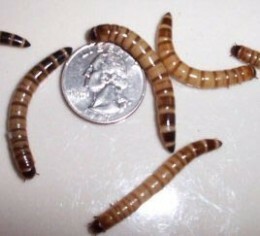 Superworms (Zophobas morio) are mainly sold in pet stores as food for reptiles. Superworms can be fed to flyers, Giant mealworms are not the same thing.